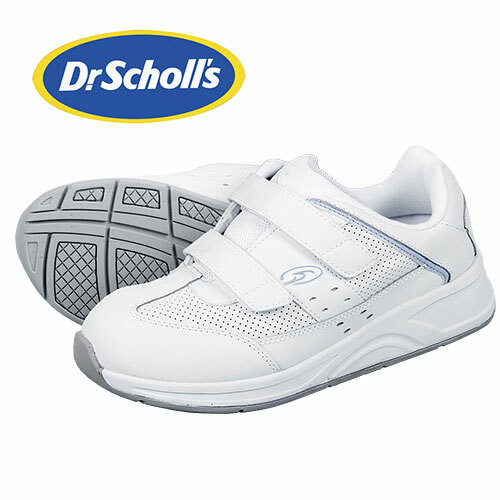 All the comfort, cushioning and protection you expect from Dr. Scholls at a low closeout price! No one pampers and protects feet like Dr. Scholls. These women's Kellie therapeutic athletic shoes have an adjustable hook and loop closure for easy-on/easy-off styling that also provides the custom fit you're looking for while the additional foot bed cushioning delivers comfort that lasts all day. Also features genuine leather and mesh uppers with extra toe room, super-soft single-seam lining, DriLex technology for exceptional moisture management, Aegis microbe shield to help control odors and rubber outsole. Color: White. Womens size 6W.